Crabtree extends a hearty thank you to the four school groups that braved the cold with us for a chilly yet pleasantly sunny MLK Day of Service. 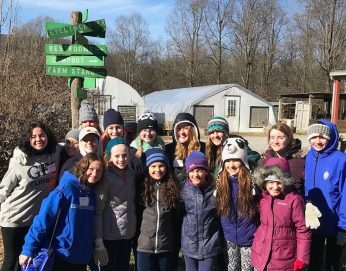 Girls Preparatory School, Baylor School, Southern Adventist University, and McCallie School all sent us crews of students who showed up with work gloves, smiles, and positive attitudes despite the low temperatures. Altogether, these groups totaled 43 volunteers generously donating 150 hours’ worth of work on the farm. Those hours of help are invaluable to a lean operation such as Crabtree and represent weeks’ worth of work that allows our farm team to focus on the myriad other winter farming tasks we face. These hardworking students added to our brush pile as they weeded our blueberries and blackberries; mulched the blackberries with cardboard and wood chips; cleared areas that we mow in the warmer months of sticks and branches; hauled, chopped, and rearranged firewood; cleaned up the Evelyn Center; and helped our farm team immensely by being willing to tackle odd jobs that can so often get pushed to the back burner during our busier growing seasons. Thank you, MLK Day volunteers! Crabtree wouldn’t be here without help from wonderful folks such as yourselves.